Welcome to University of Pennsylvania Field Hockey Camps! Penn Field Hockey Camps was created in the hopes of growing the game by providing ample opportunities across many age groups, the resources to learn the technical and tactical aspects of the game, and inspire passion for competing. Each camp and clinic is specifically designed to help teach and perfect the basics. While the basics are the foundation for elevating your game to the next level, the staff will also challenge each individual and team with more advanced skills and larger game concepts. 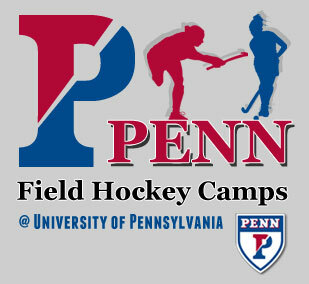 Penn Field Hockey Camp Staff includes Head Coach Colleen Fink, Assistant Coaches Katelyn O’Brien and Jen Rauscher. Penn Camps will also include Penn Field Hockey Players both past and present as well as some special guest coaches from area colleges. Penn Field Hockey sessions are open to any and all participants; limited only by age, grade level, and/or gender. This clinic is open to all high school girls.